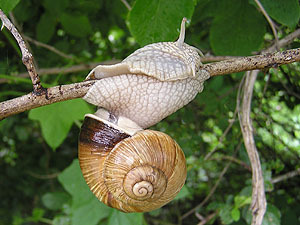 Observing a terrestrial snail, such as the Roman snail Helix pomatia, in nature, one will quickly discover the snail to be very well adapted to its environment. The soft, flexible foot adapts to any underground, and thanks to the negative pressure exerted by the foot sole, the snail can also crawl in any thinkable position, even head (or shell, that is) down. A question, which arises though, is which senses a snail uses to receive information about its environment, and how it reacts to that information. Some simple experiments can hopefully answer that. The best known sense of snail certainly is their tactile sense or sense of touch. Almost everybody might once have touched a snail's head to see, how it withdraws its feelers or tentacles, a movement which is amazingly fast for an animal as slow as a snail. Observing a snail moving through its natural environment, this withdrawing of feelers can often be seen, as it happens each time the snail encounters an obstacle. And when it does, the snail examines the surface closely with the feelers before crawling over it. Experiments on a snail's sense of position. [RN]. 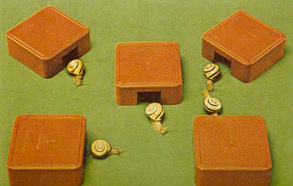 A very interesting and spectacular experiment to test the tactile abilities of a snail is the razor test. For that you need a snail and a knife, at best a razor, but any knife will do, though a razor is of course more spectacular. To fasten the razor on the table, two lumps of plasticine or Play-Doh on either side of the handle will do fine. Then the snail is placed with its head in front of the knife, so it has to start moving of the blade. Not only is the snail able to do so unharmed, but also it becomes very well visible, how it examines the blade with the tentacles before moving over it. This movement of course is very much supported by the slime the snail crawls on. 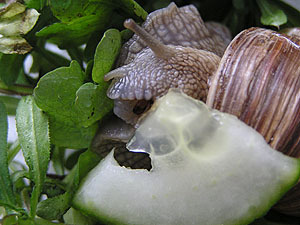 Snail slime or mucus reduces the friction between the snail's body and the surface it glides on. But at the same time, it improves the snail's hold on the ground. Also the snail's method of locomotion produces low pressure under the snail's foot sole. This additionally improves the snail's hold, so it can easily glide head-down as well. 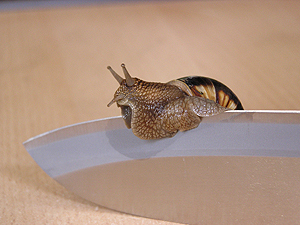 Picture series: A snail crawling over a knife blade. 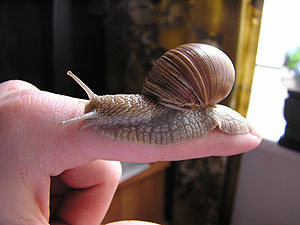 During this experiment the snail not only uses its sense of touch, but also that of position. This sense also called the snail's static sense, after having been turned over, enables the snail to recover into a normal position of the shell protecting the body. Of course the snail must also always know its relative position, when trying to move over a knife blade. A snail's sense of position works on the basis of the so-called statocysts, two liquid-filled globular organs on both sides of the pharyngeal ring (the snail's central nervous system, in a ring around the pharynx or gullet). 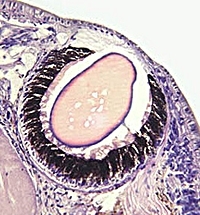 When the snail changes position, chalk grains (statoliths) in the statocysts move due to inertia and touch sense hair on the cysts' walls, resulting in sensual information to the snail. The chemical senses – the senses of smell and taste – are different from all other senses. Tasting happens in direct contact with the matter tasted. So the sense of taste is a contact sense. The sense of smell, also called the olfactory sense, on the other hand, is a distance sense, as matter can be smelled from some distance. The difference between both senses is easily tested: If a snail is offered food, it will crawl towards it from some distance. If this food has been prepared with a scentless, but disgustingly tasting, matter, such as acetylic acid (the acid from apple vinegar), the snail will crawl towards the food, as it can smell it, but then will withdraw with a clearly visible reaction of distaste. Another experiment not so clearly showing this difference is to place a snail in a ring of strongly smelling (and tasting) salve. The snail will try to move out of this circle using an opening, or if there is none, negotiating the circle clearly avoiding to touch the salve. There it becomes also visible, that snails are not only able to smell and taste with their lips and tentacles (where the largest number of densely placed sense cells are to be found) but also, albeit with lesser effectiveness, with the rest of their body. Lens eye of a snail (Helix pomatia). Similar to their more highly developed relatives, the cephalopods, terrestrial snails, such as Helix pomatia, possess a highly developed sense of sight. Though their eyes' performance is adequate to that of vertebrate eyes, molluscs' eyes such as a snail's or a squid's, are built in another way. They are everse, developed by the body wall shaping like a bowl or later like a cup. The light sense cells, evolved from the former body wall cells, are therefore pointing towards the light falling in from outside and not, like in the vertebrate eye, pointing towards the eye wall. Light and dark experiment with banded snails (C. nemoralis). With a simple experiment the observation can be made that snails can tell the difference between light and dark: Snails are brought into a dark box with one opening. They will come out of that opening, the experiment becoming clearer, when performed more often and with different snails. Snails can also observe obstacles from a distance of several centimetres or inches. A snail placed under a glass bowl will avoid an obstacle it sees outside the glass wall, though it cannot be hindered by it. Also it will crawl towards food visible outside, though it cannot reach it.